On a sidenote, this one looks to be the cousin of that POS hotel down the block, I think it's a Marriot. The fact that it will hide the black glass west facade of the HSBC building is a plus. They gotta lose that Attia building. Screws it all up. Trouble is, it's the biggest one! "A statement from the Historic Districts Council maintained that the design was inappropriate and not harmonious with the nearby Knox Building or other Beaux Arts buildings on the block. Commission chairman Robert Tierney asked the applicant to work with the commission's staff to refine the design and then return. " Lets hope they work further on this design. This is one of the prettiest blocks in Manhattan.... with its own skyline. What a great place for a dome... a spire... some interesting set-backs. As I said in the other thread, this render looks very similar to POS Marriot on 41st. Ick. I know it's not easy to tell from the renderings we have, but I have a feeling this design is very good. Maybe not interesting in its overall composition, but I see signs of quality materials and a highly contextual curtain wall. This architect's done some good previous work with some more traditional materials and colors, and I don't think we should knock this design until we know more about it. A modest but possibly winsome design. A revised design for a proposed, 31-story, mixed-use tower at 20 West 40th Street was presented this afternoon to the Landmarks Preservation Commission, which had held a hearing on the prior design in January. The proposal requires some building waivers and seeks to use a restoration plan for the former Knox Hat Building that had been approved in 1994 when the Republic National Bank intended to develop this long-vacant site, which extends through to 39th Street. The bank had developed the large office tower directly south of the Knox Hat Building in 1981 and at that time received a building bonus for agreeing to maintain the Knox Hat Building, which was incorporated into its new building program at the site, in good condition. The bank, which is now part of HSBC, decided not to proceed with the new building and therefore did not start the restoration program. 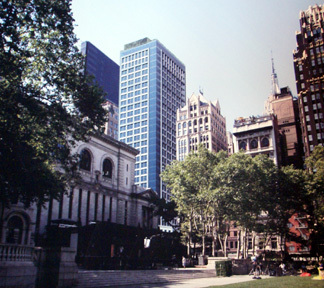 According to Morris Adjmi, the project's architect, the proposed building is a transition between the taller HSBC (formerly Republic Bank of New York) tower that wraps around the Knox Building, and the landmark American Radiator Building, now the Bryant Park Hotel, further west on 40th Street. 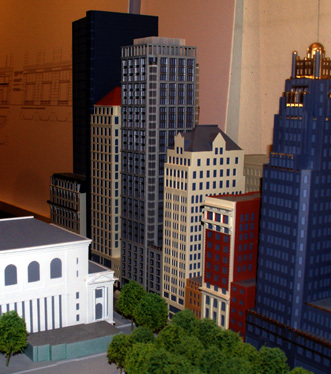 The proposed building is across 40th Street from the landmark New York Public Library. The tower will have 150 hotel rooms and 64 residential condominium apartments. The new tower would be a couple of doors to the west of the 29-story tower at 450 Fifth Avenue that was erected by the Republic National Bank in 1985 and designed by Eli Attia with a staggered north facade that wraps around the former Knox Hat Building. The Knox building was designed by John H. Duncan in 1902 and sensitively remodeled into a bank building by Kahn & Jacobs in 1965. While it would have more floors, the proposed new tower would, in fact, be shorter than the tower at 450 Fifth Avenue. The proposed restoration of the former Knox building will recreate a curved glass entrance marquee on Fifth Avenue, replace a missing cast-iron railing on a cornice, replace non-original multi-pane windows with single-pane windows, make various needed repairs, but retain the non-original storefront configuration on 40th Street because it is bettered centered to the upper facade. Several commissioners agreed retaining the non-aligned storefront facades was preferable. The major change in the revised design occurred at the top where a colonnade has been replaced with greenery. A "sidecar" low-rise wing of the building on 40th Street was reduced two floors in height in the new design. The building's residential entrance would be closest to Fifth Avenue and the hotel's entrance would be in the middle of the 40th Street facade while a restaurant will occupy the ground-floor space to the west. The main hotel lobby will be on the second floor, which will have broad windows. The hotel will occupy floors 2 through 16. Several commissioners said that the new design was an improvement, and most said they had no problem with the tower's height. The tower will have a dark gray limestone cladding at its base and a clear-glass facade above with a light-gray-limestone "punched" grid that would protrude about a foot from the windows, which will have aluminum spandrels. Commission chairman Robert Tierney remarked that the "top needs to the re-thought and more attention given to the harmonious refinement of the base" and he asked the applicant to return at a future date. Hmmm...not sure if it's an improvement. This is where the classic NYC "wedding cake" set-back style should come into play -- let it go taller at the mid-block (the southern) side and ease it's way up to that high point from 40th Street opposite Bryant Park. So much for LPC's input. Bryant Park NEW YORK CITY-Starwood Capital Group has plans to introduce green luxury to Manhattan. The company will open a “1” Hotel and Residences at 14-20 W. 40th St., as part of its eco-friendly global hotel brand. The “1” Hotel and Residences at Bryant Park will form part of a 31-story mixed-use development that is being constructed by 40th Street Development LLC, an affiliate of New York City-based Ascent Real Estate Advisors LLC. The project will take the place of a parking lot. The property will be constructed according to LEED standards and was designed by architect Morris Adjmi. The Natural Resources Defense Council will act as an advisor on the project and will help Starwood solidify its environmental goals and standards. Starwood plans to make the hotel at least 30&#37; more energy efficient than requires by state law through day lighting, occupancy sensors, lighting control systems and Energy Star appliances. Additionally, high recycled-content and locally made materials will be incorporated into the building; and 50% of the energy used will be sourced by wind, hydro and biomass. The hotel is slated to open in 2010, and will contain both hotel units as condominium spaces. In addition restaurateur Stephen Hanson is creating a dining component for the project. "Guests and residents of the Bryant Park ‘1’ will quickly come to expect nothing less than a premier hotel and dining experience that appeals to each of their senses and promotes a sense of tranquility amid the otherwise bustling streets of Midtown,” Hanson says. “Our kitchens will use organic and other fine local ingredients to prepare extraordinary meals that are completely in tune with the building's environmental conscience." The “1” Hotel and Residences brand is also being attempted in Seattle; Scottsdale, AZ; Fort Lauderdale, FL; Mammoth Lakes, CA; Washington, DC; and Paris. Copyright &#169; 2007 ALM Properties, Inc. All rights reserved. so - did this win approval from landmarks? It sounds like people are talking about this as though its been approved, yet the last article in the thread suggests landmarks hasn't signed off on it. Landmarks has no control over this site. Interesting factoid (and londonlawyer et all - this is going to break your hearts) - the masonry & iron fence that surrounds this parking lot is the last bit of the former "Wilkie Memorial Building"
The New York Times said this parking lot, across 40th Street from the New York Public Library, is "perhaps the most elegant one in Manhattan." The reassuring iron fence and stone wall force drivers to use the back entrance (where they belong), save the pedestrians on the near side from having to dodge out of the way of moving vehicles, and partially hide the view of the parked cars. But the fence exists only because it was required by the City Planning Commission, and still, it borders a parking lot — the most wasteful and inappropriate use of space in the city center. The story of how this lot came to replace a much beloved and heavily used building is a sad tale of a city deteriorating and a preservation apparatus that didn't reach a building in time to save it. A nine-story Flemish-style clubhouse designed by Henry J. Hardenbergh was built here in 1907 as the home for the New York Club. The building had a limestone base on the ground floors and a brick facade with carved stonework on the upper floors. Arched windows were framed by four pairs of Doric columns between the second and fifth floors. The club, adjacent to the Republican Club and the Engineers Club, formed a little row of clubs across the street from Bryant Park. When the New York Club withered, the building was purchased in 1945 by supporters of Freedom House, a nonprofit organization "devoted to strenghtening free societies," in The Times's words. Freedom House named the building in honor of the 1940 Republican presidential candidate, Wendell Willkie, and used the building for its offices and to provide low-cost space to numerous other nonprofit organizations. By the mid-1980s, ownership of the building been handed down to the Willkie Foundation, which shared all its directors with Freedom House. Late in 1984 or early in 1985, the Willkie Foundation sold the building to the Republic National Bank of New York for $5.7 million with the understanding that the bank would assume ownership on July 1, 1985. The organization sold its building in part, it said, because it could not keep up with the costs imposed by Local Law 10, a law passed by the City Council in 1980 after a Barnard College student was killed by falling masonry. The law required owners of buildings more than six stories high to have their buildings inspected every five years and make prompt repairs if needed. As early as 1979, it had been suggested in a citywide survey that the building be put on the list of buildings under consideration for landmark status. It is forbidden to alter the structure or facade of any landmarked building, or even one on the list to be considered a landmark. Owning a landmarked building is often viewed as a burden by landlords, who must comply with heightened upkeep regulations and most importantly, are generally unable to build a larger building on site or enlarge the landmark. Contrary to what one might think, landlords often lobby strenuously against landmark status for their own buildings. Perpetual preservation loomed over the Willkie Memorial Building in early 1985, when, shortly after completing the deal to buy the building, but before even taking ownership, Republic National Bank offered to perform the work necessary to, er, keep the building up to code. In 1983, the bank had completed construction of its new $55 million skyscraper headquarters at 452 Fifth Avenue, two doors down from the Willkie Memorial Building. The bank had plans for this nearby site that didn't include preserving a 1907 clubhouse, no matter how architecturally meritorious. On the frigid evening of Feb. 15, 1985, a crew of workers took jackhammers to the facade, stripping balustrades and stone carvings around the windows and chipping into the four pairs of Doric columns. A spokeswoman for Freedom House said the work was needed to comply with Local Law 10, but the City Building Commissioner, Charles M. Smith Jr., said the work on the facade "had gone beyond safety-compliance procedures," as The Times paraphrased. But they had a permit for daytime work, so there was nothing the commissioner could do aside from temporarily halting nighttime work. The Landmarks Preservation Commission hadn't acted quickly enough, and preservationists were furious that the building hadn't formally been listed. "We have a small staff of 50 persons, and we're not able to move quickly to protect all buildings identified as significant," Lenore Norman, the commission's executive director, told The Times. Preservationists noted that by vandalizing the facade, the workers had ruined the chances that the building would be landmarked. Perhaps that was the point of all that haste. Even before the destruction of the facade, Freedom House had asked tenants in the building, which included the Public Education Association, the New York City School Volunteer Program, the Citizen's Housing and Planning Council and American Movement for World Government, to vacate by mid-June. The tenants sued Freedom House later that year. The suit was settled out of court, probably with Freedom House putting money into a housing fund for the nonprofits it made homeless. Meanwhile, the building stood vacant and shrouded by scaffolding. Not long afterward, it was demolished, leaving only the parking lot and a nine-story outline where it had stood against the adjacent building. Public word of Republic National Bank's plans for the lot first surfaced in 1991. Eventually, we learned that they intended to build a 16- or 17-story tower that would have been connected to the building at the rear, which is or was the bank's data center at 1 West 39th Street. The tower, to cost a reported $2.6 million in 1994, was to have been desiged by Fox & Fowle and have had "a limestone facade, recessed flanks, a two-story entry and a pyramid top," as The Times described it. But the effort to build that tower seems to have stalled before December 1999, when Edmond Safra, the 67-year-old billionaire owner of Republic National Bank, was killed in a fire set by his nurse, and Republic was bought by HSBC for $9.8 bllion. The parking lot's new corporate owner seems not to be in a hurry to develop this site, as a temporary permit for the parking lot has been extended for some years now. The Willkie Building will never return, but one would be happy to see something fill this void in the city's fabric.